Justin Agnarsson is stationkeeper and lone crewman of South Atlantic House of Refuge #49, a floating sanctuary for the thousands of mariners and seasteading families who live and work in the 350-mile long Plata Raft. Now, war threatens to bring an end to his lifesaving mission as an Argentine warship pursues a pair of refugees to the station. A house of refuge is supposed to be inviolable, but the Argentines are hell bent on their mission. Alone and virtually defenseless, Agnarsson faces an impossible choice between duty and survival. But when the brutality of war threatens to unravel the fabric of civilization, more than lives are at stake. House of Refuge was the second-place winner of the 2014 Libertarian Fiction Authors/Students for Liberty Short Fiction Contest. The Kindle edition contains the original short story — plus exclusive bonus artwork and an appendix exploring some of the organizations, locations, and equipment featured in the story. A group for those who love to read or watch stories with libertarian themes as well as those who create them. A nonprofit institute working to enable seasteading communities — floating cities — which will allow the next generation of pioneers to test new ideas for government. House of Refuge is set in the Ascension Epoch universe. This is an open-content shared universe intended to be collaboratively developed with writers and artists like you. There’s another Ascension Epoch novel available for free in the Liberty.Me library: After Dark After Dark is the story of Sebastian Pereira, an impetuous teenager who decided to become what he always dreamed of being…a superhero! The world that Sebastian lives in is different from our own, yet recognizable. He lives in Pittsburgh, a city still transformed by the Martian invasion (a la ‘War of the Worlds’) more than a century ago. The United States has been dead for more than 100 years; North America is broken up into dozens of small states, confederations, anarchic alliances, and free cities. Pittsburgh itself is a city of block governments, neighborhood associations, subscription patrol companies, and rights enforcement agencies trying to establish a better way of doing things in the face of a withering city government. Society is in many ways freer and more advanced than our own, and culturally much different as well. There are even personal aircraft! But this parallel universe is no utopia of perpetual sunshine and flowers. There is still crime, corruption, and racial tension, especially between radical talents (people with superpowers) and the existing order. As the costumed crimefighter known as Torrent, Sebastian runs up against werecats, mad gassers, corrupt police, supernatural vandals, and seductive radicals in the Global Parahuman Revolutionary Army. His challenges are ethical as often as they are physical, and his toughest opponent may be his fallen nature. Can he really serve justice as a vigilante, or is he only serving his own ego? I’d love to hear what you thought of the book, our characters, and our setting. 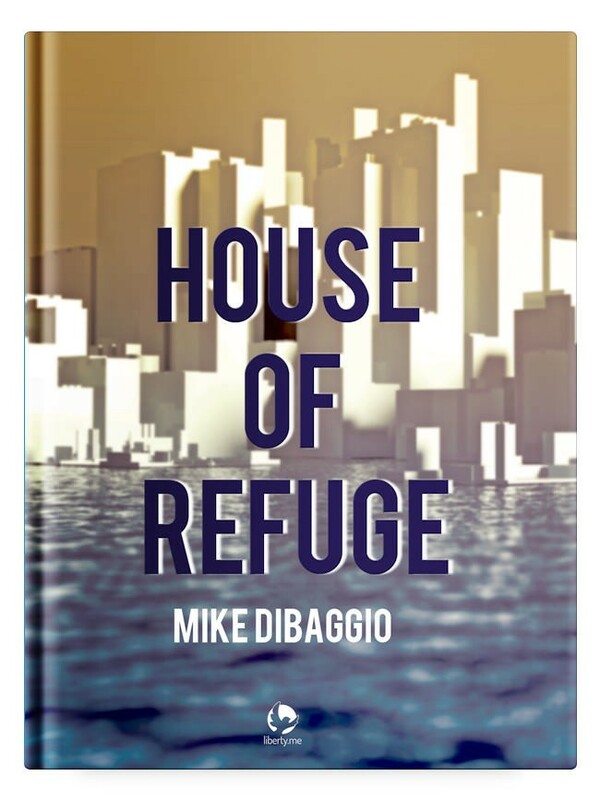 House of Refuge, is an award-winning libertarian short story by Mike DiBaggio. As BK Marcus puts it in his foreword, “Mike DiBaggio’s story of adventure and heroism exemplifies the sort of fiction I think the freedom movement needs much, much more of — a tale that demonstrates the evils of force and the virtues of freedom without ever allowing an ideological agenda to distract the reader from the action and drama.” Members can download it for free from our Library. Let us know if you enjoy the book as much as we do.